By 1943 it was already clear to all the military forces involved that the Second World War was turning in the Allied Force’s favour. Germany and Italy continued to be defeated on the battlefields and especially in our country the doubts about a “distant” war, causing deprivation and so much sacrifice, became more and more common among the people and government of Italy. This mistrust was well known by the German political elite which decided in May 1943 to send a few divisions of German soldiers into the Italian peninsula, to support our troops in the defence of the borders, with the view that it was likely that there would be an imminent Allied landing, but also to keep the Italians operations under observation, as they feared that the Italians would likely surrender to the Allied forces. British and American troops meanwhile were getting closer to the Italian coastline, after defeating the Axis Forces in Africa, thanks to a huge military arsenal and the self confidence of an African victory . On the 11th July 1943 the landing in Sicily happened very quickly and in just over a month the island was completely occupied: Italian troops surrendered and the Germans, the only ones to oppose the Allied Armies progress, were forced to retreat to Calabria. Meanwhile, Mussolini had been deposed, arrested and imprisoned (25th July 1943) and the new Government, whose head was General Badoglio, secretly began negotiations to surrender to the Allies and sign the armistice. At the same time, so as not to arouse suspicion among the Germans, continued to announce their support for the Axis alliance. Germany did not trust the Italian reassurances and from the 26th July increased the number of armoured divisions, paratroopers and infantry being sent to Italy and this continued until August. There was no protest from the Italian government, who felt they had been “invaded”. During this period, the Allies heavily bombarded the whole Italian peninsula, attempting to hit industrial settlements, communications and harass the enemy forces. The damage was huge and the heaviest losses were amongst the Italian population.The unconditional Italian military surrender was finally signed on the 3rd September 1943 and publicly announced on the 8th. At the same time, the Government, the King, the Royal Family and the political and military elite prepared to leave the country fearing a German act of revenge. Abruzzo was sadly at the centre of these happenings, as King Vittorio Emanuele III and his entourage sheltered first at the Crecchio Castle and then embarked on a boat from the Port of Ortona towards Brindisi. Also in Abruzzo, Mussolini, who was then under arrest at a hotel in Campo Imperatore was liberated by an elite group of German soldiers who managed to make a daring escape and took him to Germany. This rescue was ordered by Hitler himself, his former ally, who wanted to create a new fascist state in northern Italy, under control of the German government. On the 23rd September 1943 Mussolini came back to Italy and proclaimed the birth of the “Italian Social Republic”. On the 9th September 1943, Italy was a drifting country, without any political or military leadership. Hitler used this absence of control to quickly bring thousands of German soldiers into Italy, occupying it de facto and declaring it “War territory”. The Military command for the operations in southern Italy was given to Commander Kesserling. The consequence of the occupation was very heavy: Italy handed over political control to the Germans and the population would be forced to collaborate, being forced to carry out all heavy duty work including all agricultural and industrial production. The Northern Army was disbanded and all weapons and military equipment was commandeered. Italian soldiers, from every operational front, in Italy or abroad, tried to return to their home towns. They were immediately arrested in mass and disarmed by the Germans and asked to choose between fighting for the Nazi fascist ideal or being interned in prison camps in Germany. Almost everyone chose imprisonment, harassment and atrocious living and working conditions rather than collaboration with the Germans, who by then were considered the enemy. Italy would pay for the human and economic cost of a war which it had tried to escape from. Meanwhile, the Allies were pushing forward for the liberation of the Italy from the south, focusing on conquering Rome first, then the North, to finally reach southern Germany and then Berlin. Frequent bombing broke the Italian territory, from north to south, and allied land and sea operations were successful, despite a determined German resistance. American and British troops proceeded in parallel along the two sides of the Italian peninsula, rapidly reaching the central regions, where Italy gets narrower and is divided by the Appenines. It is at this point where Rome appears to be so close, yet is still untouchable. The 8th Army fought mainly in Abruzzo , and was made up of divisions which came from all over the commonwealth (United Kingdom, New Zealand, Canada, India etc.,), these troops were commanded by General Montgomery. It consisted of thousands of well equipped men and supported by a huge logistic network making supply operations a simple process without any apparent problems. The German troops held their own against the Allies, even though they were fewer in number and not as well equipped as the Allied forces. The Germans engaged in a “fought retreat” which attempted to slow down the liberating troops and give time to their own soldiers in the rear to organise a defence. The approach of winter and the proceeding of the Anglo-American troops towards the capital city, prompted the German military leaders to consider a defence strategy which would attempt to fortify of the territory of Abruzzo, taking advantage of its natural mountainous and inaccessible landscape to slow down the allied progress. From the Sangro river to the Garigliano river, virtually cutting Italy in half, a swift operation had been put in place to realise the construction of the Gustav Line. Between September and October 1943 the German soldiers, who until then had just sporadically appeared in the small towns and villages of Abruzzo, settled everywhere, commandeering strategically important houses and locations, confiscating everything they needed (food supplies, vehicles, fuel, weapons) and enlisting, under pain of death, the local population to build fortifications, digging trenches and artillery emplacements. The ever evolving theatre of war led to the evacuation of small centres, in order to facilitate German military operations. The majority of the inhabitants from the towns affected by the German strategies were reluctant to leave their homes and the few possessions they still had. Everything that hadn’t been already commandeered by the Germans were bricked up in some under stair storage area or hidden away carefully. Many used to leave during the day, sheltering in farmhouses, in caves or woods, to come back at night and sleep in their own bed. If initially the German occupying troops were quite tolerant with the Italians who didn’t comply with the orders given, however with the progressive advancing of the British troops and with the increase of the Italian participation in acts of sabotages and guerrilla warfare, German feelings towards the local population worsened and reprisals began, such as shootings and mass slaughter. The acts of revolt against the German occupation were common from the beginning of the war. The Banda Palombaro, which was founded in Chieti but had been operating in the area between Palombaro and Fara San Martino from September 1943, initially focused on sabotage and espionage, evolving later as a guerrilla warfare. This first group of partisans faced the counter-attack of the German troops, and some patriots were shot and many others ran away to reorganise in Chieti or become part of other partisan groups. It was in the first days of October 1943, the days of the peoples uprising in Lanciano where people who were starving and oppressed by the German abuses rose up an formed an armed rebellion. It was just a short footnote of history of the German occupation in the town, but it gave a clear sign of the tenacity and the strong will of of the people of Abruzzo to fight for their own freedom. This desire for freedom was increased by the knowledge that the Allies were gaining ground and getting closer to Abruzzo. On the 2nd October the Allied troops entered Termoli but the progress northward was fiercely opposed by the Germans, who fought for every inch of territory and to gain time and fortify as much as they could the north side of the Sangro. At the beginning of November the divisions under the command of General Montgomery were already in Abruzzo. The objective of the Allies was to conquer Rome and the control of Abruzzo was crucial in creating a corridoor to bring supplies along and to reinforce the American 5th Army on the Lazio front where things had halted and were in deadlock. Parts of the British army were fighting on the Adriatic coast and others were fighting on the mountains of Abruzzo. Military operations were very difficult on the coast: the conquest of the southern territories of the Sangro took about ten days, while crossing over and reaching for the north side of the river was more complicated. The Germans had mined and blown up every bridge on the two banks, destroying the railway bridges as well as systematically destroying the Sangritana railway (connecting the coast to the mountains, and crossing the Sangro river). The adverse weather conditions of that November made the river current faster and the water level higher; bridges built by British sappers, were swept away, the roads became muddy and impassable and the aircraft were not effective due to rain and clouds. Moreover, the Germans were positioned on the hills overlooking the river and from that vantage point they could control the movements of any Allied advance. The Allied troops had already arrived in the area of the river by the 8th November, but due to troop organisation and then the bad weather conditions the attack was delayed until the 27th November. Taking advantage of the element of surprise and under cover of darkness, the battle of Sangro began. In the first days, the operations focussed on Mozzagrogna and Santa Maria Imbaro, then later towards Fossacesia and the coastline on the east, and towards Lanciano and Castel Frentano on the west. The battles then split into two directions: one northward on the coast, where the bloody battle of Ortona took place, and one towards Chieti, and the conquest of Orsogna and Guardiagrele. On the mountain sides, the German garrisons were numerous and well fortified. The Allies let the Germans intercept false communications about an imminent Anglo-American attack in the area of Alfedena, Roccaraso and Castel di Sangro, to divert attention away from the actual military operations on the coastline. The German defensive positions were then increased on the Gustav line and that area became impregnable: on the uplands machine-gun nests were placed to contrast any allied advance, foxholes were dug, fortifications and shelters were built and the territory was carefully mined. Nevertheless, some towns were liberated at the beginning of winter: Alfedena and Castel di Sangro were already under Allied control from the 24th November 1943. Other towns in the hinterland had a different destiny, they were evacuated by the Germans, ransacked, and then systematically mined and destroyed: it was the ‘scorched earth’ policy, so that the Allies would not be able to repair them, nor find supplies, or anyone who would welcome them or give information or support. There was a stalemate on this side: the operations were made difficult by a very cold and snowy winter, and the difficulty in supplying food, equipment and reinforcements. There was also a new Allied strategy which chose to concentrate the efforts in Western Europe. The Italian campaign was moved to the background while preparing for the landing in Normandy. Soldiers were then moved, means and founds used differently, and the Anglo-Americans faced a period of struggle on the Gustav Line. The Allies did not advance and the front would only move forward between the end of May and the beginning of June 1944, when the German Army retreated from The villages of Majella and Upper Sangro, after the Germans defeat at the long and bloody Battle of Cassino. This was the definitive breakthrough of the Gustav Line and by June 1944 the whole territory of Abruzzo had been liberated. Villages were mostly reduced to rubble and often, when Allied troops arrived they could only find ruins and local people slowly coming back to what once were their houses, worn out by hunger and abuse. But they could also find the joy of a people who had just been freed and wanting to rebuild their homes and their lives. The same people who never surrendered during the long months of German occupation, who tried to counter it by passive resistance, by sabotage and in some cases, with proper guerrilla actions. The Allies were often supported by the local population in military operations: many, mostly young men, volunteered to help the Anglo-American fighting in places where German soldiers still had their garrisons. They offered to guide them, fight with them, to be with them on the front-line. The story of The Majella Brigade is emblematic: its first group was located in Casoli Castle, where the allied command had located to better manage operations on the mountain side. Some were intellectuals who wanted to fight for democracy, others just citizens from every social standing who fought for freedom and for their territory. Leading these volunteers was the Lawyer, Ettore Troilo, who negotiated with Major Wigram, in charge of the allied base of Casoli, and who allowed these Italians to fight alongside and support the British troops. The courage and dedication of the volunteers of the Majella Brigade would win the admiration and trust of the allied command, and they would become legendary; there were many requests to enlist in the Voluntary corps of Majella, and not only from the young men from towns in Abruzzo. As this group of extraordinary partisans advanced with the Allies northward, liberating Marche, Emiglia Romagna and Veneto, other men from these liberated areas joined this group of fighters. The Majella Brigade was the only partisan group honoured with the gold medal for military merit. In the early 1940’s Abruzzo was the location for several internment camps for citizens of hostile nations (France, Great Britain, Poland, Jews, political prisoners, Slavic etc.,) and people not unwanted by the Fascist regime. The 15 camps were deployed across the 4 provinces, chosen by the regime because of the geographical layouts of the region, mainly mountainous with dirt roads, and because the local population was less likely to be interested in political and social issues and rather inclined to accept the government directives. The camps were not in any measure comparable with the German ones, but more like buildings where you would serve a period of imprisonment. Along the Abruzzo segment of the Gustav line we find two towns which hosted internment camps, one being in Lanciano (female) and one in Casoli (male). In other villages such as Paglieta, Castel Frentano, Atessa, Torricella Peligna, Alfedena, Ateleta and Castel di Sangro, there were facilities to accommodate people with compulsory residency, often private houses. The internees initially lived in fairly harsh conditions, but not inhumane, they were limited in their freedom of movement and expression. Unfortunately as years went by the conditions of living in those buildings became harder and harder, due to overcrowding and the lack of food supplies for the prisoners, caused above all by the rise of new racial laws. Some of the interned were moved to German camps, some others were moved elsewhere or even died. Some resisted despite their suffering and regained their freedom after the armistice and the escape of the government (8 September 1943), when the camps were closed. Some of the released internees joined the partisan fight against the Germans. 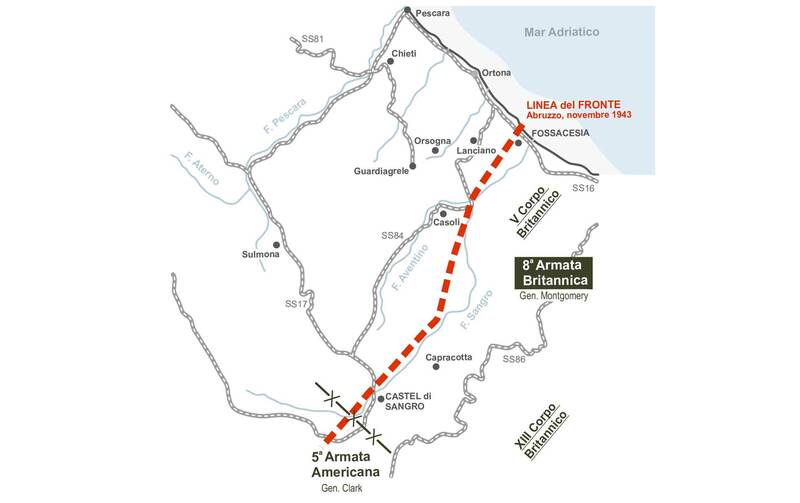 An aside note must be reserved for “Camp 78” in Fonte d’Amore, near Sulmona, which held about three thousands British soldiers, which came mainly from military operations in Africa. After the armistice these prisoners escaped, trying to make for the frontline to rejoin the Allied troops which were advancing from southern Italy. Every town and every farmhouse concealed prisoners who received help and support from the local communities, despite the death penalty notice for anyone who offered them support. Many managed to reach the liberated territories under the command of the Allies, after a long and dangerous march from Sulmona to Casoli, where the Allied command was located. Every year, the journey of this courageous undertaking is remembered through the three days of the “Freedom Trail”, which starts in Sulmona on the 25th April and arrives in Casoli on the 28th, involving the two provinces (L’Aquila and Chieti) about which we are narrating the story. On the following pages you will find the story of the events lived by men and women of Abruzzo, by the Germans and Allied troops, by partisans and prisoners, during the long and cold winter of 1943-1944, and the tale of the places where they lived, fought and died. These are the stories of the Gustav line in Abruzzo.